The Sweet Violet is full of nectar. Since the flowers open so early in the spring, when the weather is cold, there are no bees for pollination. For this reason Sweet Violets are rarely pollinated. One way the Sweet Violet reproduces is to send out runners from the roots and form new plants. Another way for reproduction is seed dispersal. The seeds of the Sweet Violet are carried by Formica polyctena ants. 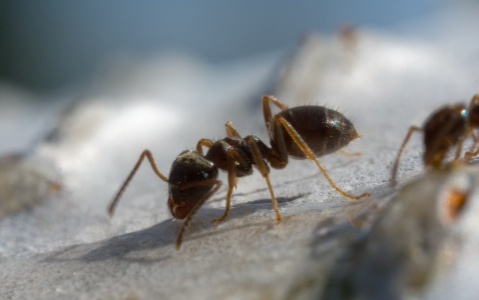 These ants help disperse the seeds to different regions. The Sweet Violet is a large-seeded obligate myrmecochore which means that is has large seeds and relies on Formica polyctena ants to disperse them. To the right is an example of the Formica polyctena ant and below is seeds of the Sweet Violet. The Sweet Violet is an angiosperm, which means it undergos a process called double fertilization. Double fertilization is when one sperm nucleus of the plant fuses with the egg nucleus to form an embryo and the other sperm nucleus fuses with polar nuclei to form endosperm. Click on the flower to see an animation that really helps explain double fertilization. 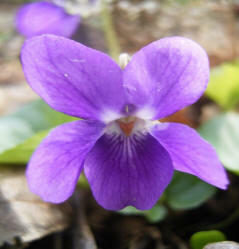 The Sweet Violet is classified as a perennial which means it lives for several years. In its first growing season it only has leaves and no flowers. In the spring/summer of each additional season the plant flowers and sets seed. In the winter the Sweet Violet is dormant and stores its energy in its roots. While the parts aboveground are dying off, the buds for the next year’s flowers, leaves and stem are forming on the roots. To learn more about how the Sweet Violet gets nutrients see How I am nourished?. 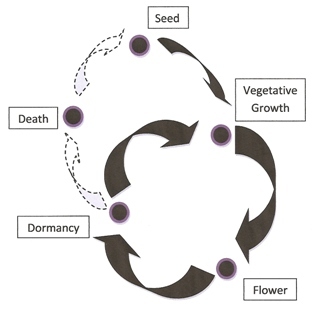 Below describes the typical life cycle of a perennial.